I’m excited about my new blog design. but as you may be able to tell, it’s still a work in progress. Most notably, comments seem to be broken. Thanks for having patience– and as I wait for my blog-fixing people to have time to work their magic, please feel free to contact me via email: mary.owlhaven@gmail.com. If you, like me, have been using google reader to read all your blogs, you are probably aware that it is going to be gone on Monday. What you may not know is that you can switch all your blogs seamlessly to another reader if you act this weekend. The reader that I think I’ll be using is Feedly. Feedly is easy to use, and even has a tutorial to walk you quickly through the transition. Another feed reader option is Bloglovin. I’ve imported the blogs I read there as well, now while it’s easy, just in case I don’t like feedly for some reason. Whatever reader you choose, once google reader is gone, you’ll have to enter your blogs manually, so do it before Sunday evening if you want to be able to do it quickly and easily. Just out of curiosity, how many blogs do you read regularly? At the moment I have 48 on my list. A day of airplanes (including all-out running between two of them) and an evening of chatting with friends (old and new) has me all worn out. I was especially delighted to see Keely, Jennifer, and Mel, all folks I met on our Compassion trip to the Dominican Republic a few years back. I’m eager to see what the Lifeway DotMom conference has in store tomorrow. I’ll be blogging highlights of talks by Jen Hatmaker and many other fine folks! Jen and I actually spent 3 minutes talking this evening and I’m pretty sure we’re now BFF. OK, I’m exaggerating, but I’m pretty sure she and I could effortlessly fill an hour with talk about adoption and Ethiopia and solving the world’s problems. You know, if she didn’t have about 40 other people wanting to chat with her at any given moment. 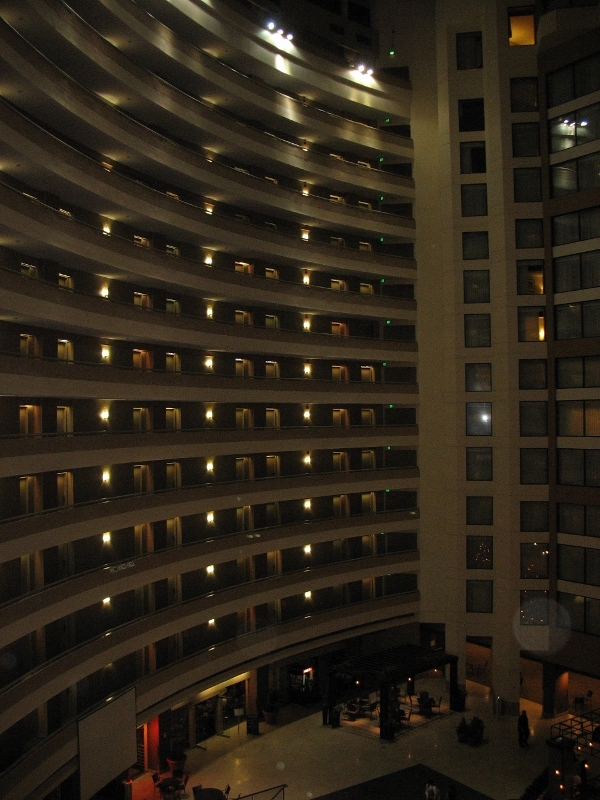 For now, here’s a view of my hotel. Looks like the outside of the building, right? It’s actually the inside, looking down into a big open area. I’m up on the 8th floor, close to the right-hand side of the picture. More tomorrow! Goodnight! I’ve been getting questions from folks wondering why I switched Owlhaven to partial feeds. Blame it on doing taxes and listening to Dave Ramsey. John and I are on track to get our last bit of non-house debt (mostly braces and some random medical bills –last year was brutal!) paid off by June. After that we aim to attack the house hard and hope to compress the remaining 7 years of our home loan down to 3 or 4 years. Exciting. But when I did our taxes this year, I ended up discouraged by my blogging income. Most months it doesn’t do more than fill up a gas tank and buy a book or two on amazon. Don’t get me wrong: that is a blessing, and I love writing here. But for my time investment? I’m pretty darned sure Dave Ramsey would tell me going back to work as an RN would be a better income boost. Even two shifts a month would beat my blogging income. Unfortunately enough folks have weighed in expressing unhappiness over partial feeds that I am wondering if it might be better to switch back to full feeds. So tricky to balance reader’s wishes for convenience with the desire to be compensated for my work. One reader did suggest a way to keep the ease of google reader while still supporting favorite bloggers with actual visits. Google reader has cool goodie called the ‘Next‘ button. Added to your toolbar, you can scroll through all your blogs (or just a specific category on your google reader blogroll) actually VISITING every single site, simply by hitting ‘Next’ repeatedly. 1. Open your Google Reader and click on the ‘Settings’ button on the upper right-hand side of the page. It looks like a gear. Then click on ‘Reader Settings’. 2. Select the ‘Goodies’ tab, then drag the ‘next’ button to your bookmarks toolbar. You’re ready to go. Easy peasy, right? I installed the button myself, have been using it for a couple days, and think it works pretty well. I’m currently subscribed to about 85 blogs, so we’ll see if the next button is something that I continue to find useful. I have to admit that partial feeds don’t bother me. But that’s probably because lots of the time I skim, and usually only read the whole post (either via the reader or the blog) if the first few lines really grabbed me. Anyway, all this rambling is mostly to let you know that I’m still puzzling over the full feed versus partial feed dilemma. But I did want to explain my reasoning behind the switch, and also to let you know that I appreciate every minute you spend here with me. My aim, always, is to make my content enlightening, encouraging, inspiring, and in every way worth your precious time. Here are some of my posts that you ‘liked’ on facebook in 2011 (THANKS so much!!) with a few bonus ones from 2010 thrown in there too. I thought it might be fun for anyone new here to have an easy way to get a sampling of what you’re likely to see here. Mothering: Good Mom, Good Kids? All sorts of life is happening here this week. One of our 13yo sons got his braces on today and has a sore mouth this evening to prove it. Thankfully 4 out of 6 of our current teenagers came by their straight teeth naturally, proving again that God provides for families in all sorts of ways. Tomorrow I am heading to the doctor to get a cast for our 8yo daughter, who fell out of a bounce house on Saturday and broke her wrist. Poor kiddo. She has had a splint for a few days and is being good-natured about the cast– has already specified that it be lime green. But still it is a tough break, especially just a few days before her birthday, just when we were set to try out the pool for the first time this week. The crazy flowerbed at the edge of my driveway is just beginning to come into its own this summer. The irises are gorgeous. There’s a whole slew of tiny blue flowers blooming fresh every day. The daylilies will be blooming in another couple weeks. And the poppies proliferated madly over the winter and are already are beginning to bloom. Sometimes trying to keep things tame in our little 3-acre corner of the world makes me a little nutty, but that flowerbed is a joy to me. It is so like our family. Un-manicured, mismatched and sometimes a little loud. Changing every day. But beautiful and utterly delightful just the same. …seems to be swallowing up alllll of my time this week, what with chatting with friends, eating extraordinary Mexican food, signing books and — yes — speaking about balancing time while homeschooling, and saving money at the grocery store. Although a few of my sentences meandered haphazardly, I was reasonably coherent most of the time. I found a surprise or two to bring home — I MISS my family! (Even the dog.) I am looking forward to meeting lots of people tomorrow. Then it is two more presentations of the same talks on Friday in Tulsa– looking forward to meeting you, Tulsa people! Saturday morning I head for home, arriving in Boise only an hour before our newlywed daughter Erika, who is almost is done with her semester as a student in Chile. We will be so glad to have her home. I will be glad to be home as well. But for now I am off to bed. Hope your week is going well too! Meet me in OKC? Tulsa? If Tulsa is closer for you , there’ll also be a gathering for Tulsa bloggers at Savastano’s in Tulsa/Bixby on Thursday, April 28th at 7PM. I hear the pizza there is great. Melanie of Blogging Basics is going to be there. Maybe Shannon of Rocks in My Dryer? Maybe, maybe even my dear Jeni of One Thing, who I am quite sure is a soul sister but who I have yet to meet in person. And…you? Hope so! This week has been a little nutty. I’ve been trying to get back into ‘real’ life after the Chile trip, and I’ve also been preparing to do a couple of talks about bringing down your grocery budget. Thursday’s talk was on skype, with patrons of the Tuskarawas County Library in Ohio. Friday morning I met with a MOPS group in Boise. Both talks turned out to be a lot of fun. People obviously cared about the topic and had great questions, which made it even more fun. And the babies at the MOPS group– be still, my heart, they were gorgeous! Shout out to any of you who might be reading here– thanks for hanging out with me and adding to the discussion. I always enjoy hearing other people’s ideas for saving money. One woman mentioned that she freezes her old bananas and then makes banana pudding out of them. I make banana bread with mine, but I haven’t tried banana pudding, so that was an interesting idea for me. Another woman said that she’s found gallon ziplocks to be cheapest at the dollar store in our area, which I thought was another good tip. I am guessing this will mostly appeal to people who are already planning on attending the homeschool convention, but anyone near OKC is welcome! If you are interested, would comment here or email me (owlhaven@aol.com) and tell me which time is better for you? There’s also going to be a meetup in Tulsa, probably Thursday evening April 28th, so let me know if you’re interested in that one too. Thanks! I am now off to run kids to soccer. Tomorrow I’ve got another big book giveaway, and I’m hoping to finish telling you about our Chile trip! We’ll see how much of it gets written!